Poetry’s work as retrieval and repair has never been more vigorously practiced than in Villain Songs. Looking into the violence that is, too often, at the heart of family life, Tammy Robacker enacts a scrutiny that leaves everyone—not least the self—irradiated. Early in this bracing book, Robacker declares that her poems are “a fire burning / to reach the other side / of my teeth.” And so, with a furious but deliberate poise, the poems do exactly that, giving image to what had been in the shadows, giving voice to what had been erased. However, far from being a project of confession and blame, Villain Songs also asks about art’s ability to evaluate and value experience. These poems are as artful as they are wounded. Spiky irony, forceful rhythms, and superb craft inform these poems, recasting the “crawl spaces of the mind” into brilliant survival songs, vengeance songs, wisdom songs. 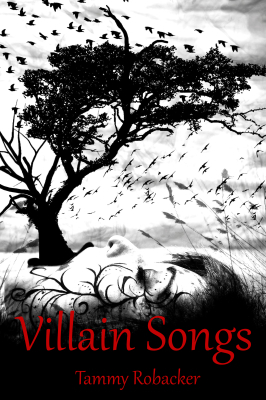 Tammy Robacker’s Villain Songs poems sing a world of menace into the light. Voyaging through a mythic-seeming land where everyday objects grow treacherous and the most vulnerable among us are used in spirit-crushing ways, she summons her considerable powers of exorcism and refuses to be silenced. With fierce associative play, finely chiseled lines, and a highly controlled sense of form, she dares to speak the hardest truths. If shame is a force that exiles us from ourselves, these poems rescue and reconstitute a home for the soul.